Their ability to eat up to a thousand mosquitoes in an hour make bats pretty good neighbors. But if they've decided to roost in your house or another section of your property, it's time to move them to a different part of the neighborhood. Here's how to safely relocate bats. Figure out where in your house or property the bats are flying in and out of. Dusk is the best time to watch for this, since this is when the bats will begin flying out in search of food. 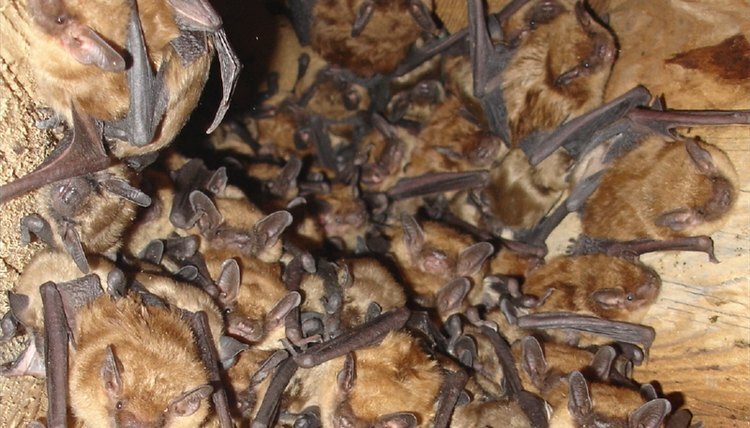 Look for telltale signs of bat occupancy, such as dark, pellet-like droppings. You may be able to hear them moving about in the roost during the day if they are somewhere in your house. Install one-way screening over the entrance or entrances so the bats can fly out but can't get back in. This is done by attaching the screen several inches above the top of the opening and along the sides, leaving the bottom of the screen hanging over the bottom of the entry by several inches. The bats will be able to push their way out but will be unable to reenter. Install a bat house on a nearby tree, post or other available structure. Bat houses can be easily built or bought (see Resources below). If possible, place some of the bat guano (droppings) on the new house to make it more familiar to the bats. The bat house should be hung at a height of at least 15 feet and in a location where the sun will warm it. Make sure the bat house has good ventilation, as well as nylon screen or plastic mesh stapled on the inside walls and ceiling to provide footholds for the bats. Wait 7 to10 days after installing the one-way screening for all the bats to leave, then permanently seal the openings. Be ready to install the bat house at the same time you put up the exclusionary screening. Bats are extremely territorial and will attempt to come back to their original location if there is not a suitable alternative in the proximity of their current flight plan. Wait until fall, if possible, to put up the exclusionary screening. Bats in the United States and Canada have their babies from late April to late August. Putting up the screening during this time may trap young bats that are unable to leave on their own. Call a professional if you don't feel comfortable doing this work yourself. There are many wildlife removal specialists, pest control companies and other independent contractors who can safely and humanely remove bats from your property (see Resources below). Don't kill the bats intentionally or try to trap them and move them great distances. Most states have laws regulating wildlife removal and/or transporting. Be familiar with the laws of your locality. Monica Miller has been writing professionally for more than 15 years. She has been published in "Woman's World," "Country Woman," "San Diego Family," "Columbia," "The Liguorian," "Boys' Life," "National Geographic World," and many other print and online magazines. She has a Bachelor of Arts degree in political science from the University of St. Thomas. What Are the Adaptations of a Bat? What Can People Do to Help the Indiana Bat? Do Bats Really Have Poor Eyesight?